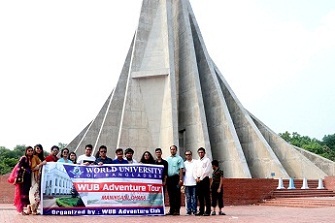 World University of Bangladesh (WUB) Adventure Club organized a study tour on Saturday, 30th March’ 2019. They visited National Martyrs’ Memorial in Savar and Baliati Zamindar Bari in Manikganj District. Four faculty members, Executive members of the club and forty five students from different departments participated in the tour. The tour was coordinated by Maruf Ahmed, Jr. Deputy Registrar, World University of Bangladesh.